Our Community Projects program gives you the opportunity to put your crafting hands to very good use. Your time and/or donations will contribute directly back into the very community that we live in. Drop in and spend an hour, half an hour or even 5 minutes, to make a difference. The Very Snuggly Quilt program commenced in 1999 as a sub-group of Victorian Quilters Inc. 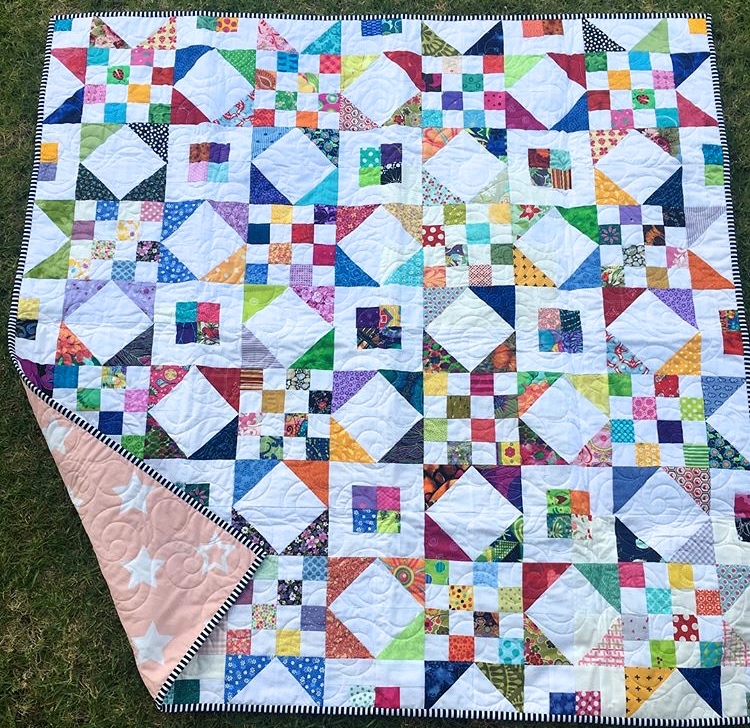 The very snuggly quilt program is responsible for making handmade quilts that are then gifted to the children who are patients at The Royal Children’s Hospital, Melbourne. Quilters through-out Australia contribute to the program and most fabric & batting is donated. On the second Tuesday of every month a team of volunteers (who are also Vic Quilters members) deliver between 150 -180 quilts to the patients. Quilts are a gift for the child to keep and take home when they are discharged. The quilts become treasured items by the children and their families and in many instances, this is the first thing that is packed when a child needs to be re-admitted to hospital. All quilts received are registered with a: quilt number, the makers name, date received, and delivery date to the patients. The registration of quilts allows the program to monitor how many quilts are available, who has donated and in the event a thank you letter is sent with the makers reference on it, we can then forward it on. Quilts are delivered to the patients on the second Tuesday of every month. The Wrapped In Love Auxiliary have a very special role delivering the quilts. It really does make your heart skip a beat when you deliver a quilt and the child realizes it is theirs to keep. For that 30 seconds they have forgotten how unwell they are and their little faces light up with joy. The day before quilt delivery day we call all the ward clerks for patient lists. The information we receive is the patients age and gender. Due to privacy laws we don’t know the patients name or illness. We then go off to the storage unit to select the appropriate quilt for that child. The right size and colour is specially picked out for that child. This quilt number is then recorded on the patient list against that bed number which is then entered into the database. The storage unit is set up so that quilts are in gender and size order which streamlines the process. The process of selecting quilts take approximately 4-5 hours. There are approximately 12 volunteers on the Wrapped In Love auxiliary. Each member has undergone police and working with children checks and has undergone the hospital accreditation program. On actual quilt delivery day there are 6 volunteers, who then break out into two teams of 3. With suitcases filled with quilts we present to each ward. Our first task once on the ward is to reconsolidate the patients and note any changes…. There are always many changes. When with the patient we introduce ourselves, tell the patient a little about the group and what we do and offer them the quilt. There are often tears of happiness, smiles of joy, hugs from parents and grandparents and nurses coming to see what quilt a child has received. There is a real buzz on the wards when the ‘quilt ladies’ arrive. The quilt delivery team complete delivery just in time to have lunch together, share stories and support each other as some days it can be tough depending what is happening on the wards. The quilts are often seen around the hospital on patients’ wheelchairs, in prams and being dragged along the floor to the next appointment. The quilts definitely provide a comfort for the patients and their families and quite often parents come and find the volunteers to say thank you and how the quilt has brightened up a tough day. Boomerang Bags is a community driven initiative tackling plastic pollution at a grassroots level. We, at Boomerang Bags Ascot Vale are part of a much larger movement, in fact we are one of over 600 communities worldwide who are striving to make a difference at a local community level. We make bags for our local community in order to provide a sustainable, plastic free alternative to the dreaded single-use plastic bag. Every week, a group of passionate and dedicated volunteers made up of those who have been there from the start as well as newbies, (whom we welcome with open arms and blasting sewing machines), get together and get the bag production line up and roaring. Our volunteers are not made up of people who can sew. There are so many jobs required as part of the bag making process which means we call on an array of skills. Every week we have ironers, cutters, tea-makers, music players, fabric sorters, ‘sew-at-home’ pack makers, come together with the united vision - which is to do their bit to contribute to the sustainability of our local community, from a plastic-wise perspective. In addition to this, we have a number of volunteers who choose to sew at home. In this case, we provide little ‘sew-at-home’ packs to these volunteers from doors and the bags are sewn up at the volunteers convenience! Our fabric is sourced from donations, and retrieved from hard-rubbish (most of which would end up in landfill), its cut up using templates and then the glorious bags are sewn up. We have our very own Boomerang Bags logo, which we stamp or screen print onto our cut pockets, which are then proudly sewn onto the bag. The end result is dozens of unique, strong, lovingly made, up cycled fabric bags which are distributed to the local people of Ascot Vale, who happen to shop on Union Road, Ascot Vale. Our bags stands have made their way into a few shops located on Union Rd, namely Bakers Parlour and The Urban Wellness Project. These traders are proud to represent us as a group of locals, striving to provide a solution to the overwhelming problem that is the use of single-use plastic bag. At our event at the SoulCraft Festival, we hope to bring to you, a ‘Lets make a Boomerang Bag’ Workshop, where we gather together, no matter what your skill or skill level is and churn out the bags. We would love attendees to get into either cutting up fabric using templates, or hopping on a machine to sew up a bag (instructions and support provided).